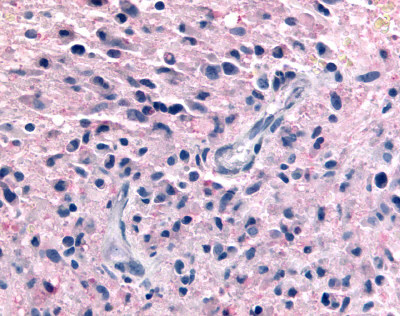 Anti-P2RY12 / P2Y12 antibody IHC of human Brain, Glioblastoma. Immunohistochemistry of formalin-fixed, paraffin-embedded tissue after heat-induced antigen retrieval. Anti-P2RY12 / P2Y12 antibody IHC of human blood, platelets. Immunohistochemistry of formalin-fixed, paraffin-embedded tissue after heat-induced antigen retrieval. 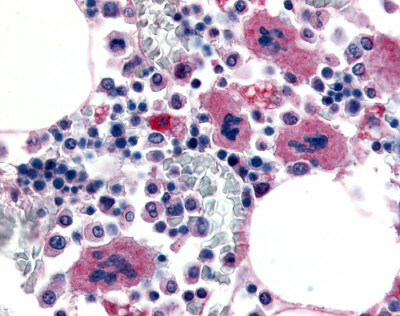 Anti-P2RY12 / P2Y12 antibody IHC of human bone marrow, megakaryocytes. Immunohistochemistry of formalin-fixed, paraffin-embedded tissue after heat-induced antigen retrieval. Western blot analysis of rat brain membranes (1, 2) and human platelets (3, 4): 1, 3. 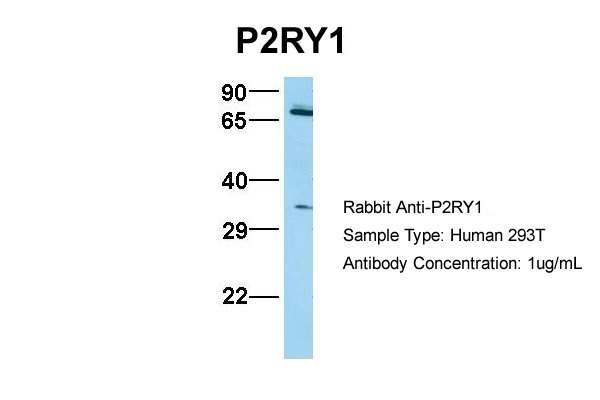 Anti-P2Y12 Receptor antibody, (1:200). 2, 4. 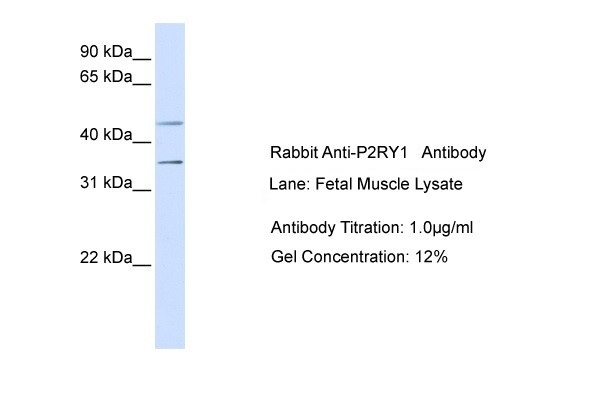 Anti-P2Y12 Receptor antibody, preincubated with the control peptide antigen. Expression of P2Y12 in mouse brain. 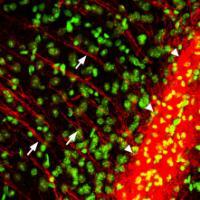 Immunohistochemical staining of P2Y12 (red) in mouse brain using Anti-P2Y12 Receptor antibody. The region shown in this picture is the entorhinal cortex in mouse brain. The P2Y12 positive fibers (arrows) run from the corpus callosum (triangles) into the deep layers of the entorhinal cortex. Sytox green is used as the counterstain. Western blot analysis of rat brain membrane (lanes 1 and 3) and MEG-01 (lanes 2 and 4) cell line lysate: 1-2. Anti-P2Y12 Receptor (extracellular) antibody, (1:200). 3-4. Anti-P2Y12 Receptor (extracellular) antibody, preincubated with the control peptide antigen. 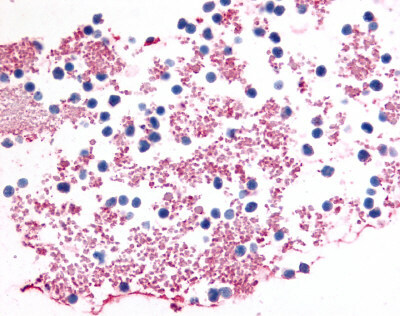 Expression of P2Y12 in rat RBL cells.Immunocytochemical staining of intact living rat basophilic leukemia (RBL) cells using. A. Extracellular staining of cells using Anti-P2Y12 (extracellular) antibody , (1:100) followed by goat anti-rabbit-AlexaFluor-594 secondary antibody (red). B. Live view of the cells. 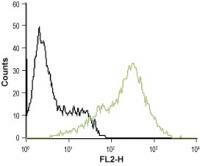 Indirect flow cytometry analysis of MEG-O1 living cells: black line: Unstained cells. Green line: Cells + Anti-P2Y12 Receptor (extracellular) antibody, (5-10 µg/1x106 cells).